Anyways not much to add! Just been very busy. Most of the USA Mare Internum Kickstarter orders have been shipped out, and the International orders are going out soon as well (I had to revise how I’m shipping them to make sure they arrive in good condition around the world). Pins will likely be up on Gumroad for general sale early next week. Apologies if I’ve been slow to respond to anyone’s emails or messages, have been utterly swamped lately but am digging myself out with a spoon. I will be answering stuff tonight and there will be some Patron posts tomorrow, so stay tuned! And, another page either late tomorrow but more likely Saturday morning, since packing orders took me longer than anticipated. FINALLY gonna see that processor tho! Also, Alloy has been announcing it’s invited artists, and they’re all rad, so there’s that too (new invitee announcement tomorrow). You can still submit your pitch to that until the 27th of the month, yay. So this a bit of a weird question, but are the Wollaria better at climbing then humans, even in gravity that’s 1/3rd as strong? I mean, on one hand Kalla’s got arms to days, but on the other, we Terran organisms are probably pretty dense when it comes to musculature. Not terribly better tbh, their bodies evolved to grip rock faces in tidal zones; walking was a little bit further down the line. So they can be adept at things like running, climbing, etc, but aren’t exactly strongly suited towards those things. Good Googly Moogly! Is that actualy NIGHT SKY she’s seeing? Haha, looks like it, but it’s just that darn ceiling. When you said kickstarter I freaked for a sec, thinking I missed the book. When is the book coming, do you think? March 1! I was originally going to do Feb but a friend reminded me that Feb is Black History Month, and I thought it’d be respectful to wait and not get my streams crossed with actual black creators (vs accidentally shoehorning my way in with a fictional black character). Prologue? Surely you mean epilogue? I’m clearly not an epifessional proof reader. Wait, there’s an opportunity to buy Mare in book form? I thought the Kickstarter was just for pins and stuff. There will be a book Kickstarter in March 2018, and yeah the last KS was just for pins (and to keep me on my toes). More like keep you on your pins and needles, amirite? Eh? Ehhhh? Looks like she’s nearly there! She could see stars, finally. Unless the caves have an airlock, the surface has to be miles above. There’s no sign than Kalla technology can mess with physics (or at least does so casually/routinely). She’s looking at bioluminescence, chemiluminescence or light bulbs. And so the survivor toiled on toward a yet unseen goal, machinery of vast power and unfathomable programming, the next step unclear but determined to reach it! Are those stars up ahead? And, where’s her helmet? Kudos to her for attempting that climb in a space suit! Panel two is accurate, that’s how it feels, been there. Exactly, that “!! !” feeling of almost falling over backwards. Great update! Good to see her get up and fight her way on. And with meeting the processor soon, probably literally. Processor: I am glad to meet you, doctor entomologist. Here is what I am, our purpose here and how everything works. Would you like a lift to the surface, or some tea first? Processor: ha ha kidding. “You” and “Michael” walked out of the cave a week ago. The Michael clone’s shuttle should reach third planet in a third of a sun cycle, and by a few cycles we hope to suppress the natives and start terraforming. Wait, are these stars? Isn’t she gonna suffocate? Another piece of toast pops out of Mike, and Kalla grabs it first. Love the details of the lighting, as always. 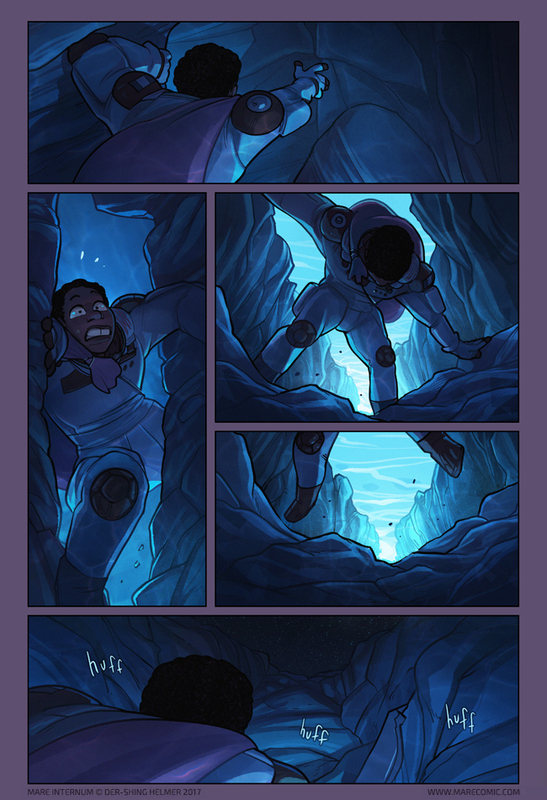 As an avid caver, I have done that exact climb in the second panel many times. Reading this comic reminds me how much I love being underground. Any caver worth their headlamp wouldn’t go down if there were even a slight chance of a flooding hazard, so consider it if you ever have some time off between drawing beautiful and amazing comics. …oh, right. Never consider it. Stars? Or bright shining creatures stuck to yet another roof? Heart twisty feeling again. Whoops, is back up now!